The purpose of this article is to look at four important aspects that are essential to understand the nature of the capability that makes EA actionable, and to prepare for the challenges. Enterprise Architecture capability enables an organisation to assess and control its transformations in a robust manner, thanks to a reliable source of knowledge. 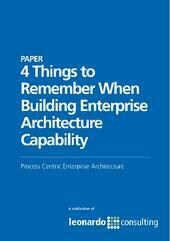 Download this paper to learn more about Process Centric Enterprise Architecture (PEA) and how you can put these into practice in your organisation.